Performance by Anna Grinberg, Liam Viney from the CD Works by Percy Grainger, Robert Davidson, Carl Vine, Matthew Hindson. Works by Percy Grainger, Robert Davidson, Carl Vine, Matthew Hindson. 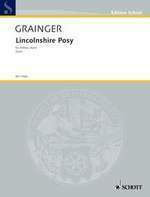 Book: Australasian music research 5 : Percy Grainger issue / editors: Malcolm Gillies, Mark Carroll. 23 Nov 2019: at Australian Stories (Concordia College Chapel). Featuring Adelaide Wind Orchestra, Bryan Griffith. 22 Jul 2018: at No Strings Attached! CD Launch Concert (The Concourse, Chatswood). Featuring James Brice, North West Wind Ensemble, Castle Hill RSL Youth Wind Orchestra. 28 Oct 2017: at ANAM at NGV: Australian Art and Music (National Gallery of Victoria - The Ian Potter Centre). Featuring ANAM Musicians. 15 Sep 2017: at Elder Conservatorium Wind Orchestra (Elder Hall). Featuring Elder Conservatorium Wind Orchestra, Luke Dollman. 21 Mar 2015: at Hobart City Bands in concert (Hobart Town Hall). 20 Aug 2011: at Wind Symphony (Elder Hall). Featuring Robert Hower, Elder Conservatorium Wind Orchestra.